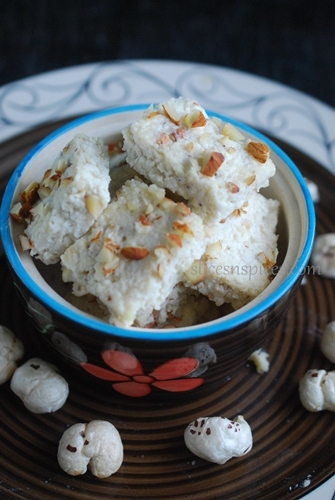 Navrati fast recipes, Makhana Malai barfi, lotus seed nuts and fresh cream sweet, easy barfi recipes, Indian sweets under 20 minutes, makhane ki barfi Navratri fasts brings with it few food restrictions, as well few otherwise less commonly used ingredients into use. A time to cleanse the body, its a traditional way of detoxing and draw all your energies inward for a spiritual experience. 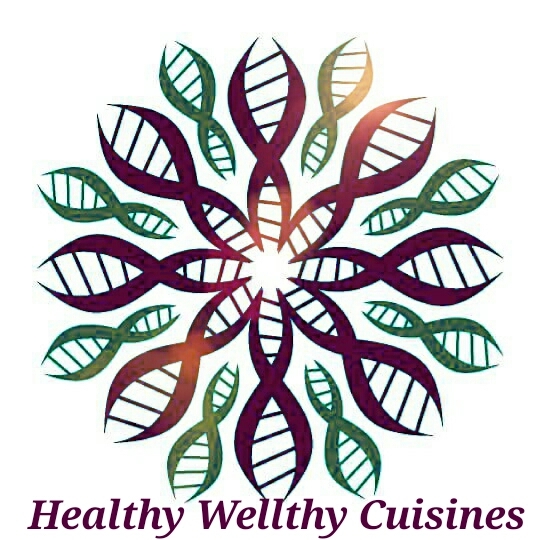 A variety of lentils, grains and few vegetables are avoided, bringing in some very healthy alternatives without compromising on nutrition. Lotus seed nuts/ phool makhane is one such healthy ingredient widely used during the Navratris. A versatile and a power packed ingredient , it fits perfectly into sweet and savoury dishes likewise. 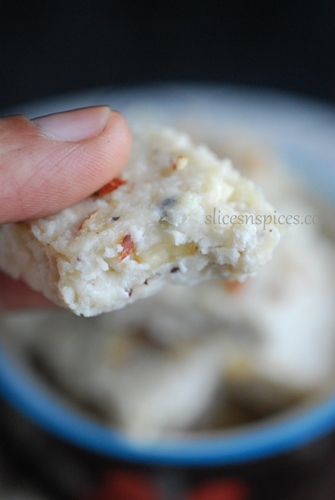 A pineapple phool makhane ka halwa was on my blog last year. 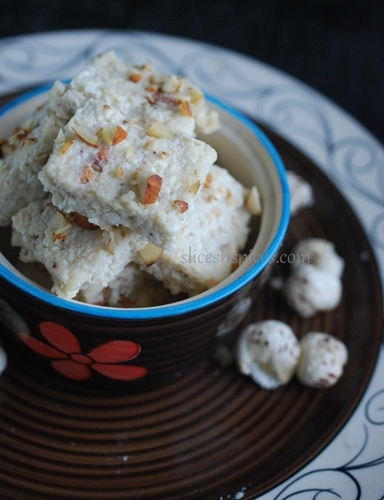 This year its a barfi, a milk based dense square shaped sweet, made using makhana (lotus seed nuts) and malai (fresh cream). Makhana /lotus seeds,absorbs a lot of moisture and yields a dry flour when powdered. hence to keep the sweets moist I used some crumbled paneer and fresh cream. A little more amount of paneer would have given more juicy moist barfis, but nevertheless happy with the outcome. These are not too sweet, relatively healthy ingredient loaded ( if you count out sugar) and can be made in just under 20 minutes. If you are still short of time, go ahead and scoop spoonfuls right out of pan, and they taste equally delicious when hot! Powder the dry roasted lotus seeds ( makhane)in a blender. Keep aside. In a thick bottom pan , add Amul cream. Bring it to boil and lower the flame . Keep stirring. Powder granulated sugar along with cardamom pods. Add this powdered sugar to the boiling cream. Mix well. Add powdered lotus seeds to the cream, stir well. Lastly add grated / crumbled Paneer and mix well. Saute the whole mixture on low flame till it comes together and starts leaving the pan at sides. Add chopped roasted dry fruits ( I used almonds, you can use any variety or combination). Reserve some for garnishing. Spread the mixture evenly with a spatula on a greased or non stick plate. Garnish with some more dry fruits. Refrigerate for few hours , cut into small squares with a sharp knife and serve. Two minute choco lava cake!